MANCHESTER, N.H. -- For eight innings, the Eastern League All-Star Game was a tightly contested affair featuring quality pitching and timely hitting. Sparked by an unlikely power source, the Western Division All-Stars defeated their Eastern Division counterparts, 8-3, on Wednesday in front of 7,517 fans at Northeast Delta Dental Stadium. Pitching before his hometown fans, New Hampshire's Zach Stewart retired the first five batters he faced, including consecutive strikeouts to open the second inning. But Francisco Martinez of the Erie SeaWolves singled and Brock Holt of the Altoona Curve sent a line drive over the right-field fence to make it 2-0. Holt, who has one homer in 85 regular-season games, took home the Star of Stars Award. "I was just looking and trying to get a good pitch to hit," he said. "And with the count, it was going to be a fastball and I was able to square it up and hit it out of the park, so that was exciting. "I don't hit a lot of home runs, so I don't really know what one feels like when you really get it. But I knew I hit it good and the ball was really carrying to right, so I knew I had a shot. I just put my head down and started running." For six innings, pitching was the dominant storyline. The West did not allow a hit until Will Middlebrooks of the Portland Sea Dogs doubled with one out in the fourth. The East nearly got on the board, but Binghamton's Josh Satin was thrown out trying to score from first. The stellar pitching was highlighted by Harrisburg's Erik Arnesen, who struck out the side in the second, and Trenton's Manny Banuelos, who matched him in the third. The stint by the Yankees prospect was part of a four-inning stretch in which the East struck out five without allowing a hit. With its pitchers keeping the score close, the East tied it in the sixth. Corban Joseph of the Trenton Thunder greeted Erie's Jacob Turner -- the Tigers' top prospect -- with a single to center and advanced to third on a passed ball and a wild pitch that came on ball four to New Britain's Yangervis Solarte. "Same as always, just go out there and get the guys out," Turner said of his approach. "I got behind, 3-0, gave up a base hit, struck the next guy out. Same approach every time I go out there, really. "I think I only threw 10 pitches, so it was tough to gauge what I really had a feel for or not. Left a couple baserunners on and I think I was only gonna throw around 10 pitches, no matter what happened." With runners at the corners and one out, Turner was relieved by Altoona's Aaron Pribanic, who allowed run-scoring hits to Trenton's Austin Romine and New Hampshire's Mike McDade, the pregame Home Run Derby winner. Pribanic (1-0) kept the score tied by retiring Reading's Matt Rizzotti on a comebacker and getting Portland's Alex Hassan to line out to third. "Rizzotti, I just wanted to get ahead, and then if I could get ahead and try to punch him out, I was going to do that," Pribanic said. "Obviously, he swung at the first pitch and grounded it back to me, so that worked out the same way. "Hassan, with two outs and two runners in scoring position, I definitely didn't want to give him anything real good to hit with [a base] open. He had a good at-bat and thankfully hit one that ran out of gas." 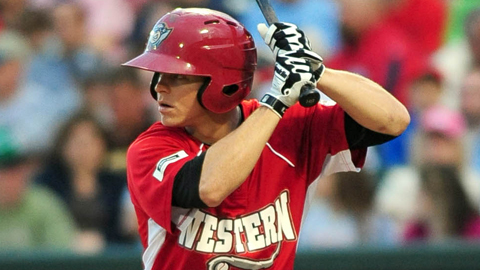 The West regained the lead in the seventh against New Hampshire's Joel Carreno (0-1). Harrisburg's Bill Rhinehart doubled and advanced to third when Hassan slipped and fell after catching Martinez's fly ball. He scored on a single by Richmond's Charlie Culberson, who'd replaced Holt in the fifth. Culberson stole second and scored on a base hit by Flying Squirrels teammate Roger Kieschnick. Both players finished with two hits, with Culberson scoring twice and driving in a run and Kieschnick scoring once and plating a pair. Erie's Justin Henry delivered the big blow in the ninth, chasing Portland's Alex Wilson with a two-run single. New Hampshire's Moises Sierra, the Home Run Derby runner-up, plated a run in the bottom of the ninth as the East loaded the bases. But Solarte popped out to end the game. Brian Moynahan is a contributor to MLB.com. This story was not subject to the approval of the National Association of Professional Baseball Leagues or its clubs.